Following numerous developers stating how hard it is to monitor and keep track of iOS App Reviews on the iTunes store, we decided it was time to investigate the possibility of resolving their pain. We too were aware that to view reviews it is necessary to look in iTunes Connect at every individual store, all 155 of them! The app reviews a user sees in iTunes are only the ones from their home country, not the world. Whilst some services exist to pull app reviews together, there wasn’t anything that met with our need to be able to filter reviews by rating, automatically translate or email specific reviews to support for investigation. Most of all, we want access to the data, in our pocket at any time. The idea for AppReview360 was born. We set about detailing the requirements, and researching the relevant API’s from Apple, in order to gather the relevant review data, and then manage it in a usable fashion for the user. It was decided that we should allow for the app to automatically check for new iTunes app reviews in the background, and alert the user as new app reviews are found via notification centre. Thus eliminating the need for the user to have to remember to check. Which App Store app reviews should we read? Obviously, as App Developers, or App Owners, we should read them all. After all, the user has taken the time to provide the feedback, good or bad. We all want 5 star app reviews right?! But what about the lesser star ratings? The 4 star, the 3 star, the 2 star, or the dreaded 1 star review? Wouldn’t it be nice to be able to view say any 1 star app reviews in date order at any point? 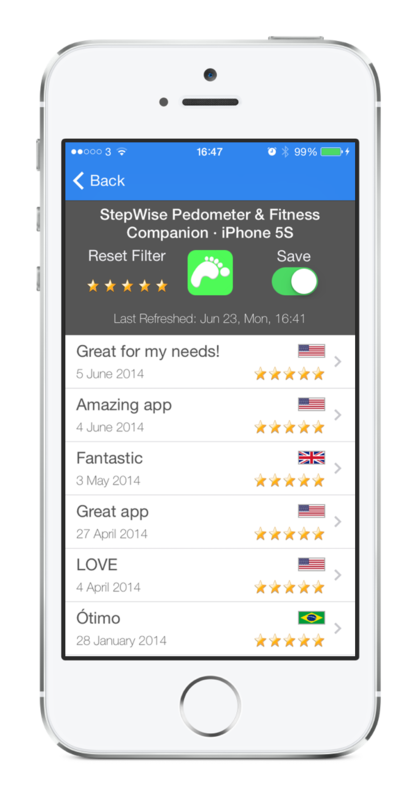 With AppReview360, simply tap the star rating you wish to see, and the relevant reviews are there. Tap an app review, read the full detail, see the country of origin, with flags for quick reference, which version the user was reviewing, and the full review details. Did you spot an issue in an App Store review that you need support to look at? Tap Email from within the review, and send it for investigation. One of the obvious obstacles with global iTunes App Store app reviews is language barriers. Despite people perhaps knowing more than one language, we certainly don’t know them all! What does this app review actually say? With this dilemma in mind, we provided the easy option to automatically translate any app review into your home language, simply tap translate. AppReview360 is free to download. 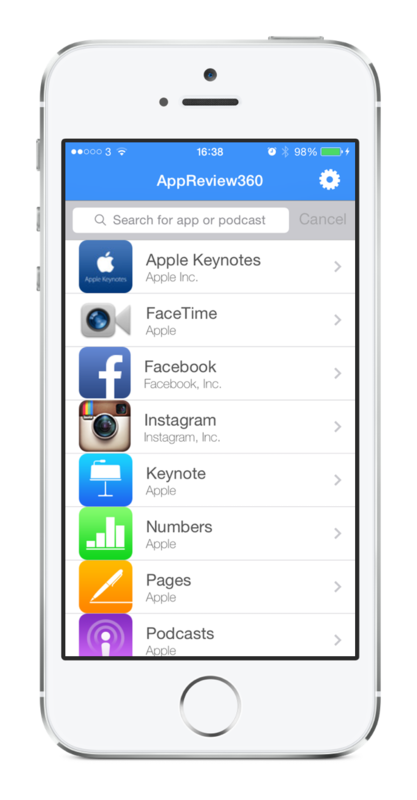 It will allow you to see the last five app reviews for any app. Want to see more? Or want to have Appreview360 monitor in the background? We know that developers don’t want to spend fortunes on apps or services, so we offer very reasonable subscription options of 1 month, 3 month or 12 month blocks, the longer the period, the greater the saving. Add together all the time a developer spends searching for app review data over a year, and we are sure you will agree it is a very inexpensive and worthwhile way to improve your processes. What’s more, we offer a FREE 7 day trial! There you have it. Save as many apps as you wish and let AppReview360 take the strain. 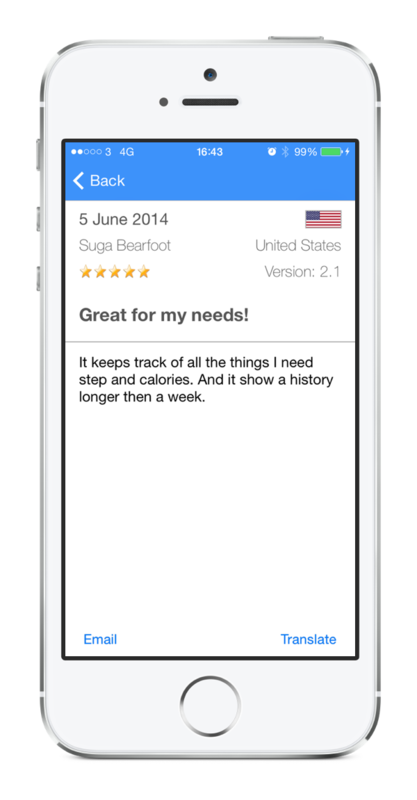 Start proactively monitoring your app reviews, with the information delivered directly to your iPhone or iPad now. Informed developers = Better products = Happy customers. See more about AppReview360 here. Do you have suggestions? Ideas for additions? Feel free to get in touch with us and we will be more than happy to discuss them with you.